Russian President Vladimir Putin, right, chats with Japanese Prime Minister Shinzo Abe, left, during their visit to the Kodokan Judo Institute, the headquarters of the worldwide judo community, in Tokyo in Dec. 2016. 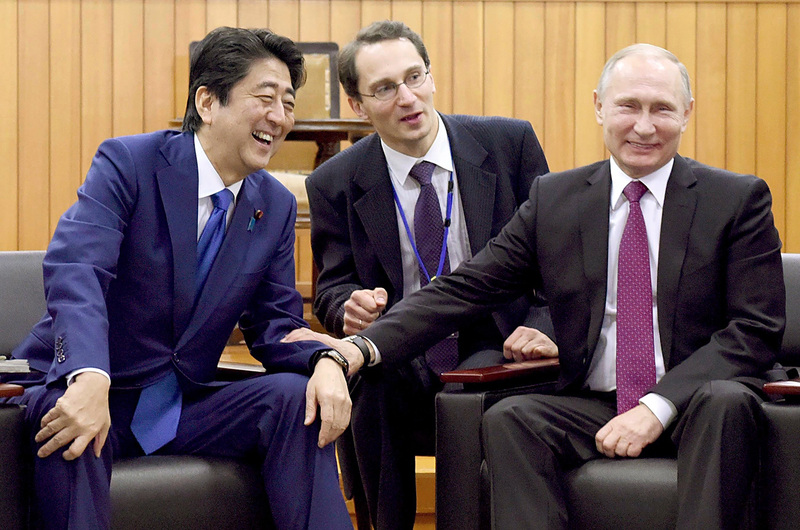 Tokyo wants to follow up on the deals signed during Putin’s 2016 visit. Japan’s Economy, Trade and Industry Minister Hiroshige Seko, who is in charge of economic relations with Russia, is due to arrive in Moscow on Jan. 11. The visit is expected to focus on the further development of economic cooperation between Moscow and Tokyo and the implementation of the accords reached earlier as part of an 8-point plan proposed by Japanese Prime Minister Shinzo Abe. The Japanese delegation that the minister heads also includes deputies of the country’s upper house of parliament belonging to the Russian-Japanese Discussion Club on cooperation between the two countries. They are planning to meet Russia’s Federation Council speaker Valentina Matviyenko, chairman of the Federation Council international committee Konstantin Kosachev and Russian senators. The 8-point plan, which Japan’s Prime Minister Abe had proposed to President Putin during their meeting in Sochi in May 2016, laid the basis for developing bilateral cooperation. The plan stipulates the development of bilateral cooperation in the sphere of energy, small and medium business, the Far East industrialization, the expansion of the export base, humanitarian exchanges and also in the field of advanced technologies, including nuclear power engineering.